The 2011 Environmental Defense Fund report, "Mercury Alert: Cleaning up Coal Plants for Healthier Lives" found that 25 plants alone are responsible for nearly a third of all mercury emissions in the power sector, while providing only eight percent of U.S. electricity. Twenty of them are located within 50-100 miles of some of the largest metropolitan areas in the country, including Chicago, Dallas, Houston, Atlanta, Minneapolis, Detroit, Pittsburgh, Cleveland, St. Louis and Austin. 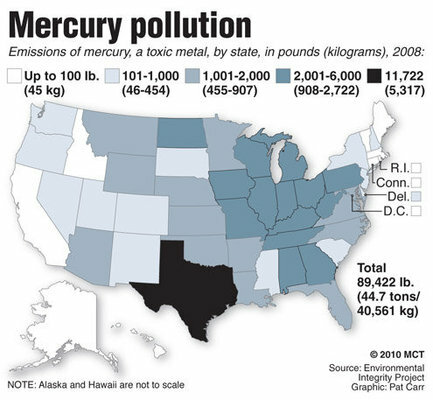 Texas led the nation in mercury air pollution from coal-fired power in 2009. Globally, Asia contributes nearly 50 percent of anthropogenic mercury emissions, with North America at 7 percent and Europe and North Africa at 12 percent combined, according to Lamar University professor Jeremy Lin in 2012. The regulatory framework for mercury from coal plants derives from the 1990 Clean Air Act Amendments. Its basic requirement was that coal plants utilize Maximum Achievable Control Technology (MACT), defined as the emissions level of the best performing 12 percent of coal plants. Studies and regulations needed to implement that requirement were slow in coming, and the process was sidetracked entirely when the Bush Administration began pushing a new approach known as the Clear Skies Initiative. Even though the legislation to enact Clear Skies was not approved by Congress, the U.S. Environmental Protection Agency (EPA) nevertheless attempted to bring via regulatory amendments. In 2005 EPA issued rules exempting coal plants from MACT requirements and instead setting up a “cap and trade” system, allowing plants with stronger controls to sell pollution credits to plants with weaker controls. Environmentalists objected that the EPA's “cap and trade” system was a backdoor attempt to evade the plain language of the Clean Air Act. Furthermore, because "cap and trade" systems are designed to optimally allocate emissions of a pollutant within an overall national ceiling, they argued that such a system was not suitable for protecting the public from a highly toxic pollutant such as mercury whose uneven deposition patterns tended to create dangerous "hot spots." Coal and utility groups lobbied intensively to help shape the regulations, which will cost billions of dollars. Paragraphs in the proposed rules are inserted nearly verbatim from memorandums from the firm of Latham & Watkins, where two top political officials in the E.P.A. 's office overseeing air regulations, Bill Wehrum and Jeffrey Holmstead, once worked. While working with Environmental Protection Agency officials to write regulations for coal-fired power plants over several recent months, White House staff members played down the toxic effects of mercury, hundreds of pages of documents and e-mail messages show. The staff members deleted or modified information on mercury that employees of the environmental agency say was drawn largely from a 2000 report by the National Academy of Sciences that Congress had commissioned to settle the scientific debate about the risks of mercury. In interviews, 6 of 10 members of the academy's panel on mercury said the changes did not introduce inaccuracies. They said that many of the revisions sharpened the scientific points being made and that justification could be made for or against other changes. Most changes were made by the White House's Office of Management and Budget, which employs economists and scientists to review regulations. The proposed regulations are available on the E.P.A. Web site (epa.gov/). The proposed rules would limit mercury emissions by an estimated 70 percent over decades and would also allow power plants to buy and sell among themselves the rights to create mercury pollution. While it is standard for the White House to review federal agency testimony and reports, E.P.A. staff members say the Bush administration also minimized the amount of mercury that comes from power plants. Over agency staff objections, the White House on several occasions in the past year added the statement that coal burning produces 'roughly one percent of mercury in the global pool. According to the E.P.A. staff, the 1 percent figure was added to an agency report on children's health; Senate testimony by Christine Todd Whitman, who was the E.P.A. administrator; and Senate testimony of Mr. Holmstead, who is the assistant agency administrator for air. While that figure is cited in the E.P.A. 's 1997 report to Congress, agency staff members and independent scientists say it is misleading because much of the mercury that ends up in the nation's water and soil comes from nearby sources. In February, 2008, the U.S. Court of Appeals for the D.C. Circuit agreed with the Natural Resources Defense Council (NRDC) and other litigants in New Jersey v. U.S. EPA, overturning the cap and trade system for mercury as well as other hazardous air pollutants (HAP) including arsenic, lead, and chromium. A basic feature of the Clean Air Act is that it allows states to enact their own rules that exceed federal standards. While the EPA delayed regulating mercury, a number of states enacted stiffer regulatory requirements of their own. Compared to the permits for new coal-fired power plants between 2001 and 2005 issued by several states, federal limitations would have allowed from 4 to 20 times more mercury from new coal-fired power plants. According to NRDC, the February, 2008, U.S. Court of Appeals ruling "will increase the pollution control obligations for new coal-fired power plants, raise the already considerable expense of these projects, and add to the weight of arguments that the public deploys to oppose conventional coal-fired plants." In 2011, the Evangelical Environmental Network (EEN) began airing 60-second radio commercial urging U.S. Sens. Carl Levin and Debbie Stabenow to embrace new EPA rules aimed at reducing mercury emissions from power plants. In the radio ads, Rev. Tracey Bianchi, an evangelical pastor and mother from suburban Chicago, argues mercury poisoning is a pro-life issue because it can cause permanent brain damage and developmental disabilities in the unborn. The campaign also includes billboards in Arizona, Pennsylvania and Ohio and emails to nearly 10 million evangelicals and Catholics. "One in every six babies in the U.S. are born with harmful mercury levels in their blood," said the Rev. Mitch Hescox, EEN president. In October 2009, EPA announced it will set standards to require oil- and coal-fired power plants to reduce air pollution. The move settles a lawsuit filed by environmental groups to push EPA to issue limits on mercury emission. Although the Clean Air Act required EPA to issue its rules by 2002, the Bush administration had deemed such regulations unnecessary. Now the EPA has agreed to set pollution standards by March 2011 on mercury and other harmful emissions from power plants. Many power plants will be required to install expensive scrubber equipment to capture heavy metals and particulates. Currently only about a third of power plants use scrubbers. Environmentalists estimate that the new rules could save 35,000 lives per year by 2025. Jim Pew, an attorney at Earthjustice, hailed the agreement as "the Holy Grail of pollution control." On May 16, 2011 the EPA announced that it would stay the effective date for its proposed Boiler MACT rules indefinitely while it carried out the formal “reconsideration” process for the rule under the Clean Air Act. Environmentalists were immediately critical, "...thousands of people will needlessly die prematurely or suffer debilitating illnesses and health emergencies," wrote bloggers for Center for Progressive Reform. "The cost of the EPA’s timidity will be high indeed." Sierra Club and others were reportedly preparing for a legal challenge to the EPA's stay. In June 2011, it was reported that proposed clean air rules released by the EPA to cut mercury emissions from coal plants would exempt lignite coal-fired plants. The EPA in setting mercury standards is putting lignite coal - found mostly in Texas - in a different category than other coal. Three of the nation's five top mercury-emitting coal plants in 2009 used lignite, and Texas utility Energy Future Holdings (owned by private-equity firms KKR and TPG Capital) has two of them, according to the Environmental Defense Fund. Some speculated the exemption was to win over swing states that use lignite before the 2012 presidential election. The EPA is now recommending court-ordered standards to comply with the Clean Air Act that call for a 91 percent reduction for mercury and acid gasses, and 55 percent for sulfur dioxide. State attorneys general could return to court if they feel final recommendations - when they become law in November 2011 - do not comply with the Clean Air Act. The EPA proposal gives other coal-fired power plants up to four years to meet the new standards. In December 2011, the Obama administration announced the new rule - the Mercury and Air Toxics Standards - to limit emissions of mercury, arsenic, and other toxic substances from sources such as power plants. Under the new rule, power plants can emit 1.2 pounds of mercury per million BTUs of energy produced. Industry had sought a limit of 1.4 pounds, but the EPA arrived at its figure based on a formula set out under the Clean Air Act, and analysts said the agency could not deviate from it. Companies would have three years to clean up their emissions of mercury and about 70 other toxic substances, and utilities could appeal for at least one more year as they install the necessary equipment. Coal fly ash is a fine gray powder residue produced by coal-fired power plants and used to make cement. Modern pollution controls in coal plants capture the fly ash before it becomes airborne. As a result, heavy metals such as mercury are concentrated in what the EPA considers "recycled air pollution control residue." In 2006, coal plants in the United States produced almost 72 million tons of fly ash, up 50 percent since 1993. The use of fly ash in cement kilns in the U.S. has grown from about 1 million tons in 2001 to more than 4 million tons in 2006. Mercury and other metals in fly ash are transformed into vapor and released out of the kiln's smokestack. A 2007 EPA study found that mercury content in ash had increased by up to 850 percent as power plants met stricter federal rules for mercury emissions. The EPA estimates that cement plants produce about 23,000 pounds of mercury per year. In New York's Hudson Valley, the Lafarge cement plant releases between 380 and 400 pounds of toxic mercury per year, equivalent to the four largest coal plants in the state. The EPA reclassified fly ash from waste to a reusable material in the 1980s. The agency adopted rules favoring cement produced with fly ash in 1983. In 1988, it reported that fly ash was not a hazardous material. The agency exempted ash from regulations for hazardous waste beginning in 1993. With new findings of increased toxic mercury levels, states including New York, Virginia, and Maryland are considering stricter rules to regulate mercury emissions from cement plants. In October 2008, researchers at the University of Michigan announced they had developed a tool that uses natural "fingerprints" in coal to trace the source of mercury emissions in the environment. The new method is expected to distinguish mercury pollution caused by coal plants from that caused by other industrial activities, as well as to differentiate between different coal deposits. The researchers hope to be able to detect mercury coming from specific coal plants in the United States, and track the movement and deposition of mercury produced by coal plants overseas. The group is currently studying which mercury sources in the San Francisco Bay area are most responsible for the contamination of fish and wildlife. In November 2008, a study found that eagles in the Catskills region of New York contain more toxic mercury than those in other areas of the state. A quarter of eaglets had elevated blood mercury levels from eating contaminated fish, increasing the likelihood of reproductive or developmental problems in the birds. A quarter of adult birds had elevated levels of mercury in their feathers. The study, conducted by the BioDiversity Research Institute and the New York Department of Environmental Conservation, found that coal-fired power plants in the upper Ohio River basin were the most likely source of the mercury. In August 2009, the U.S. Geological Survey released a study of mercury contamination in fish in 291 streams around the country. The study, which is the most comprehensive to date, was conducted from 1998 to 2005 and tested over 1,000 fish. Every fish tested, including those from isolated rural waterways, contained had at least trace amounts of toxic mercury. About 25 percent of fish had levels exceeding what the EPA considers safe for human consumption. According to the researchers, the majority of mercury contamination in the streams tested comes from coal plant emissions. In response to the study, Interior Secretary Ken Salazar commented, "This science sends a clear message that our country must continue to confront pollution, restore our nation's waterways, and protect the public from potential health dangers." An analysis of federal government data by the environmental advocacy group PennEnvironment showed that Texas, Pennsylvania, Ohio, and West Virginia's coal-fired power plants ranked highest in the nation, respectively, for 2009 mercury emissions. According to the report, Pennsylvania's power plants put out more than 15,000 pounds of mercury that year, second only to Texas. Ohio and West Virginia were third and fourth. The report also noted that three of the nation's eight dirtiest coal-fired plants are in western Pennsylvania. A January 2011 report by Environment America, "Dirty Energy's Assault on Our Health: Mercury", notes that "According to the United States Environmental Protection Agency, mercury impairs 3,781 bodies of water across the country, and 6,363,707 acres of lakes, reservoirs, and ponds in the United States are contaminated by mercury pollution" and that "The amount of mercury emitted from coal-fired power plants far exceeds the total mercury pollution from the 10 next biggest sources of the pollutant. In total, coal-fired power plants emitted 134,365 pounds of mercury in 2009." The report also noted that of the 10 most polluting U.S. power plants in 2009, four are in in Texas. For every 1,000 pounds of mercury released to the environment, the increase in the rate of special education services in Texas is 43 percent, and 61 percent for autism. Of the 10 states with the highest levels of mercury pollution from power plants in 2009 - Texas, Pennsylvania, Ohio, West Virginia, Indiana, Kentucky, Illinois, North Carolina, Alabama and Michigan - five are in the South. Yet of the 19 states that currently have mercury emission reduction standards for power plants, there are only three in the South: Georgia, North Carolina and South Carolina. Te report argues that "Under the Clean Air Act, the Obama administration’s EPA is legally obligated to propose the 'Maximum Achievable Control Technology' standard to reduce mercury and other toxic air pollution from power plants by March 2011. Using science and the regulatory tools they have at hand, the EPA should implement the strongest standard possible, and specifically cut mercury pollution by more than 90% to protect our health and our environment. While 19 states have already enacted statewide mercury limits for power plants, the EPA must set a strong federal standard that cuts mercury from power plants by more than 90%, because mercury pollution travels beyond state boundaries and puts all Americans at risk of its harmful effects." The 2011 Environmental Defense Fund report, "Mercury Alert: Cleaning up Coal Plants for Healthier Lives" found that 25 plants alone are responsible for nearly a third of all mercury emissions in the power sector, while providing only eight percent of U.S. electricity. The findings are based on 2009 U.S. Department of Energy data. Between 2008 and 2010, researchers at the Minnesota Department of Health randomly checked blood samples taken from infants born around the Lake Superior Basin, the majority from Minnesota, to examine mercury levels as part of an EPA study. In all, 8 percent of the babies had blood concentrations above the EPA health standard for mercury -- up to a thousand times higher. In Minnesota, 10 percent of the blood samples had mercury levels above the healthy standard. Babies born in the summer months, when local fish consumption is highest, had more mercury than those born in winter. The 2012 NRDC report, Poisoning the Great Lakes: 25 Coal-fired Power Plants Responsible for Half the Region's Mercury Pollution, found that 25 coal-fired power plants account for more than half of the mercury pollution emitted by the total of 144 electricity generation facilities in the Great Lakes region. The report also found that almost 90 percent of the toxic emissions could be eliminated with available technologies. Over 13,000 pounds of mercury was emitted by the 144+ coal plants into the air in 2010. Ohio emmited the largest amount of mercury from coal-fired power plants (21 percent of the total in the Great Lakes region), followed closely by Pennsylvania (20 percent) and Indiana (16 percent). The remaining five states in the region rank as follows: Michigan (14 percent); Illinois (11 percent); Wisconsin (9.5 percent); Minnesota (6.5 percent); and New York (2 percent). The coal-fired power plants with the highest mercury emissions are: Shawville Generating Station (Clearfield County, PA); Monroe Power Plant (Monroe County, MI); Homer City Generating Station (Indiana County, PA); Cardinal Plant (Jefferson County, OH); and Sherburne County Plant (Sherburne County, MN). A dozen power plants in Ohio and Indiana -- owned in whole or part by American Electric Power -- accounted for 19 percent of all mercury emitted in 2010 from the total of 144 coal-fired power plants in the region. ↑ Kate Galbraith, "If Mercury Pollution Knows No Borders, Neither Can Its Solution," NYT, Dec. 12, 2012. ↑ "32 Coal-Fired Power Plants in 13 States Now Up in the Air After Major Court Ruling on Mercury," NRDC press release, February 28, 2008. ↑ Jim Harger, "Christian environmental group says the EPA's new rules on mercury pollution is a pro-life issue" The Grand Rapids Press, December 03, 2011. ↑ Kim Geiger and Jim Tankersley, "EPA commits to set air pollution rules by 2011," LA Times, October 24, 2009. ↑ 12.0 12.1 "Spiking Mercury Levels in Coal Ash Pose New Risks" Commondreams.org, August 18, 2010. ↑ "Lisa Jackson Steps Back (Again) on Boiler MACT: One of the Top 12 Rules Now in Indefinite Limbo. Delay Violates the CAA" Rena Steinzor, May 18, 2011. ↑ Josh Kosman, "Coal regs a goldmine" NY Post, June 9, 2011. ↑ 18.0 18.1 18.2 "Fly ash: Culprit at Lafarge? Residue of coal-burning is being examined as possible source of mercury pollution," Times Union, October 26, 2008. ↑ Brian Nearing, "Mercury a concern in eagles," Times Union, November 30, 2008. ↑ 24.0 24.1 Joseph Picard, "Mercury plagues Indiana" International Business Times, November 17, 2010. ↑ 26.0 26.1 "Stop Toxic Pollution Reports" Environment America, January 26, 2011. ↑ Sue Sturgis, "INSTITUTE INDEX: Coal power's mercury menace" Facing South, Feb. 11, 2011. "Adult Women's Blood Mercury Concentrations Vary Regionally in USA," Environmental Health Perspectives, August 25, 2008. "Mercury Wars," New York Times, April 15, 2004. Fran Shor, "Brain-Dead Ploys and Heartless Republicans," Common Dreams, March 20, 2005: "The first study definitively linking mercury pollution to autism was released this past week. Almost at the exact moment, the Bush Administration announced their misguided proposals for reducing mercury pollution from coal-fed power plants. Instead of the immediate severe cutbacks in mercury pollution that are needed, the White House and the EPA promoted proposals intended to placate the coal and utility industries at the expense of children's physical and mental health." This page was last edited on 15 March 2015, at 02:58.